Very pleasant for a purpose-built centre, Risoul has the largest doorstep skiing area in the Southern Alps, being linked to Vars. Pistes are usually quiet with lift queues a rarity, unlike the sun, which shines 320 days a year. When will it snow in Risoul? 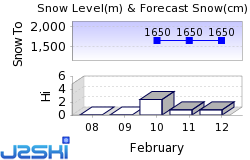 The next notable snow forecast for Risoul is 2cm1in, expected on 21 April, with around 13cm5in forecast over the next 7 days. The French Ski Resort of Risoul is part of the La Forêt Blanche ski area with access to 180km112 miles of downhill skiing, with 108 marked pistes, served by a total of 59 ski lifts. In addition to the skiing in Risoul itself (180km112 miles of pisted ski runs), the appropriate ski Lift Pass will allow you to ski or snowboard in the other La Forêt Blanche ski resort of Vars. Risoul is directly linked by Ski Lift to the ski areas of Vars. The ski resort itself is at 1,850m6,070ft, so skiing or boarding back to the resort is usually possible. With ski lifts as high as 2,750m9,022ft, skiing and snowboarding is assured throughout the season. Risoul has grown in popularity over the past two decades and is now one of the few resorts which attracts most of the major international tour operators. Although the resort has few distinguishing features it is invariably described as, very pleasant for a purpose-built centre whilst the large Foret Blanche ski area of which it is a part is the largest doorstep skiing area in the Southern Alps. The idea to build a ski resort here dates back to the mid 1940s when the team responsible for envisaging the Espace Killy and the Trois Vallées looked at the area. However, work on Risoul did not start until 1970. The skiing, which is linked to the larger and older and 'very French' resort of Vars, takes place in sunny bowls, with most of the runs ultimately returning to the resort base, so it's hard to get lost. Pistes are usually quiet with lift queues a rarity, unlike the sun, which shines 320 days a year. Risoul is located 300km (187 miles) north of the Mediterranean city of Nice and within the Queyras Regional Park, an area of great scenic beauty. The resort has been sympathetically designed using local larch wood and the pink stone of Guillestre region. The longest possible descent in Risoul is 2km1 miles long and the most difficult run is the 'Les Vautours'. Risoul's large sunny terrain is almost entirely within a vast snowbowl that allows runs to radiate out from all directions. The connection over to Vars, which was completed in 1986, is well established at a high point on the circuit giving a snowsure link and enabling a total skiable terrain tally of 180km (over 106 miles). Beginners are likely to start by using special learner tows right by the resort on the wide sunny slopes, great for staggering to one of the cafés after classes end. The compact nature of the resort means most guests will find they can get from apartment, to rentals, to ski school, to lessons to bar without too much stress. Once the basics have been mastered on the piste there's easy progression up the mountain with several long easy greens beginning higher up the bowl and served by the Clos du Vallon chair. Intermediates will enjoy the huge Foret Blanche the most with long blues and reds both above and below the treeline, the latter providing shelter on cold days. The trip over to Vars gives you a feeling of ski touring, but make sure you start heading back before 3pm in order to reach all the last lifts of the day. Popular runs include the Pinitaux Superior which includes moguls and short steeps, whilst the long blue down to Vars Sainte-Marie is an 8km (5mile) long treat. Experts have more limited choices although there are 10 blacks, the majority (eight) above Vars, which has the steepest skiing on the circuit. There can be good off-piste powder above Risoul to tackle with a guide after snowfalls, and the moderate gradients make it suitable for first-timers. A good choice for 'boarders who enjoy terrain parks as Risoul is one of the pioneers of park design with one of the best in France. The resort's terrain park is highly regarded and well designed with a wide variety of features for mltiple ability levels. Of the slopes there's a wealth of fun terrain in the trees and powder and Risoul believes that almost half of its visitors are 'boarders. We don't currently have confirmed season dates for Risoul. NOTE:- Lift and Piste openings are always subject to Snow Conditions in Risoul. Risoul is able to make snow, on 35km22 miles of ski runs, with 25 snow cannons. The 26 ski lifts of Risoul are able to uplift 22,000 skiers and snowboarders every hour. Risoul is in the French Alps in La Foret Blanche, Hautes-Alpes, France. The nearest airports to Risoul are Turin Cuneo, Turin Caselle and Chambery. There are five airports within three hours drive. The giant snowbowl above Risoul funnels down to a semi-circular bank of buildings which include bars, restaurants and shops. These remain lively all day as skiers and 'boarders stop off for snacks and drinks, and they continue to be the centre of activity after the lifts close and into the evening. The scene gets busier every year and has been boosted by the boom in snowboarder visits. Current favourites include The Yetti with a variety of Dutch beers and live music at peak times. La Licorne and La Cherine are also popular. Apart from wining and dining Risoul has a cinema, skating rink and evening snow shoe walks are organised. The two discothèques are Le Morgan's Club and Le Cham Rock. Other Ski Areas within La Forêt Blanche. Other popular Ski Areas near Risoul. For current snow conditions, see our Risoul Snow Report. Want to ask about skiing and snowboarding in Risoul? Or contact Risoul Tourist Office. Note :- The information on J2Ski concerning Risoul, where not clearly factual, is opinion only and is neither definitive or exhaustive.